Slim down JPEG images with no discernable quality loss and make room on your hard drive or flash storage. Google recently raised eyebrows with its revamped Photos service by offering free, unlimited cloud storage with a potentially huge catch: Files are converted and stored as smaller “high-quality” pictures, a departure from other cloud storage services that upload original, full-resolution images. Although professional photographers rightfully snicker at the mere mention of potential quality loss associated with smaller file sizes, the reality is many consumers don’t notice or even care—especially if the trade-off is more available disk space. As it turns out, Google might have the right idea. JPEGmini ( ) promises similar file reduction benefits for images on the Mac. The $149 Pro edition I reviewed offers three key advantages not available in the more affordable $20 version: Support for images up to 50 megapixels in size, up to 8 times faster processing speeds, and an Adobe Lightroom plug-in for slicing exported files down to size. 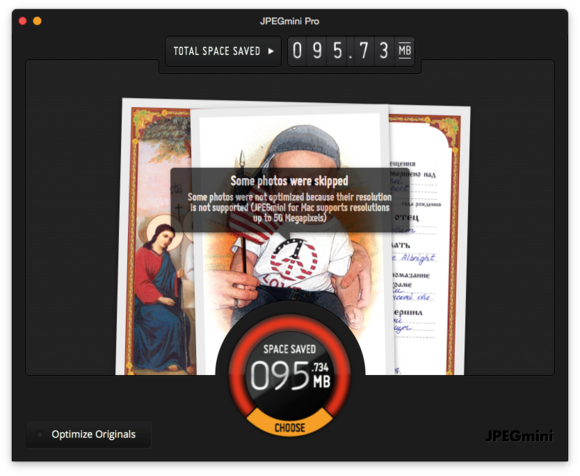 During processing, JPEGmini displays the photo currently being worked on, along with a meter showing how much space is being saved. All photo software is capable of saving JPEG images as smaller files, but engineers generally accomplish this by ramping up the compression without much regard to what’s in the photo. By comparison, JPEGmini intelligently analyzes photographs like the human eye does, compressing only areas where visible artifacts will not be apparent. The developers claim such optimizations can reduce the size of digital camera originals by at least half, and as much as 80 percent; web images produce less impressive results, with a 20 to 40 percent reduction. The application only works on RGB or monochrome color spaces (no CMYK), and is recommended as a final step, since additional processing effectively eliminates the benefit of using it in the first place. 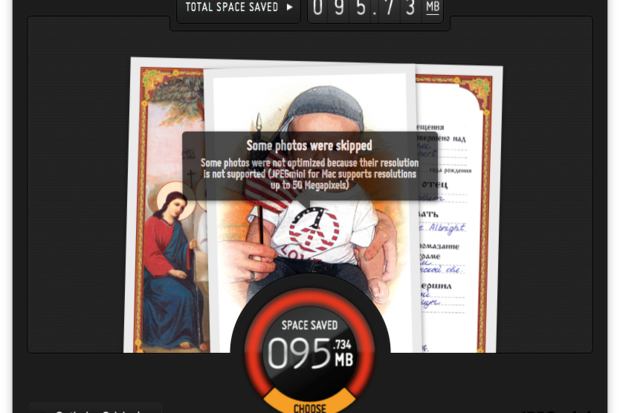 When finished, JPEGmini reports the total space saved, and warns if any non-JPEG files have been ignored. Despite the Pro designation, there are a couple of limitations to be aware of: As the name implies, JPEGmini can only read and write JPEG files, ignoring raw images or other file types. There’s also no plug-in support for Adobe Photoshop or Apple Photos, although images stored in the latter can be imported using the File > Open option like any other JPEG file. As a standalone application, JPEGmini is the model of simplicity: Drag-and-drop files or entire folders onto the window, or select images by clicking Choose. The application warns that original files will be replaced with smaller versions; upon confirmation, processing begins immediately. 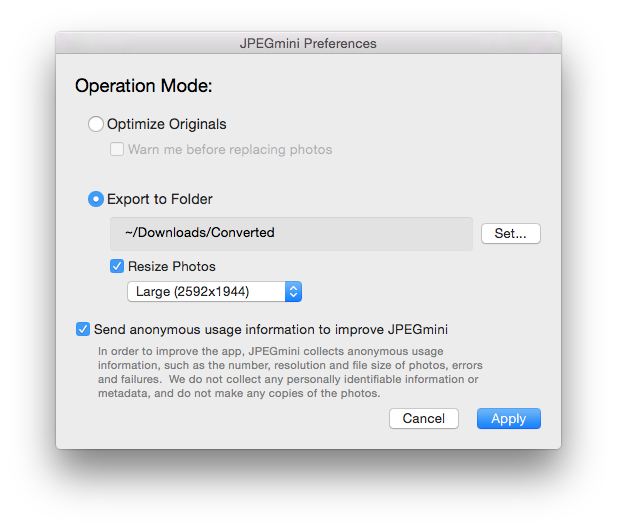 JPEGmini defaults to replacing original files, but can be configured to export copies to a new location (with optional resizing) instead. If you’d rather not replace valuable originals, clicking a button in the lower left corner allows users to select a folder where exported copies can be saved, along with the option to resize such duplicates at the same time. In my tests, processing was about 3.5 times slower than copying the exact same files in the Finder; when completed, a fuel gauge at top displays the total amount of space saved. By now you’re probably asking, does JPEGmini work? My first small batch of files scanned from old prints delivered a respectable 2.1x decrease in size, saving nearly 96MB—and as promised, no visible reduction in quality compared side-by-side with the originals. 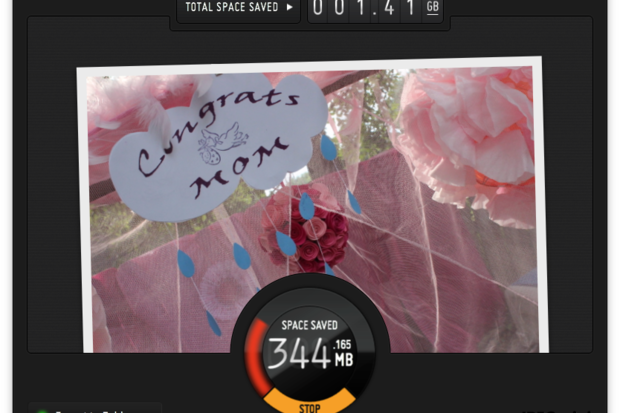 Next, I processed nearly 2GB worth of images directly off the SD card straight out of my Canon T3i, which crunched down to just over 530MB in about four minutes, an impressive 3.5x space reduction. My final test involved exporting a large Lightroom library using the JPEGmini Pro plug-in, which is inserted into the post-processing flow. (Sadly, there’s no way to optimize files inside a library.) I was able to reduce a 55GB library containing nearly 19,000 images down to only 12.75GB in about five hours using a mid-2012 MacBook Pro with Retina Display—impressive results, especially considering the process is entirely automatic, with no tweaks or user intervention required. Once inserted into an Adobe Lightroom export workflow, JPEGmini Pro automatically processes images with no user intervention. 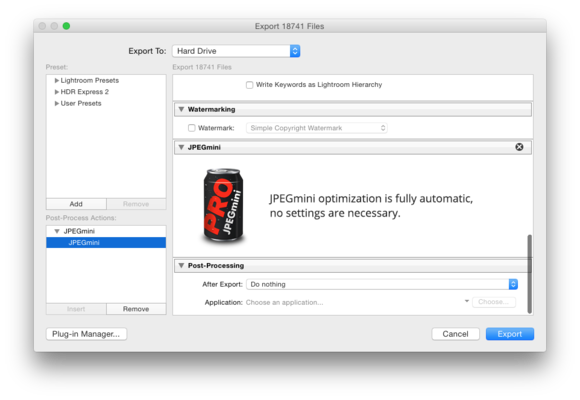 Although I wouldn’t recommend using JPEGmini Pro on original files, it’s great for cutting exported JPEG copies down to size without sacrificing quality. 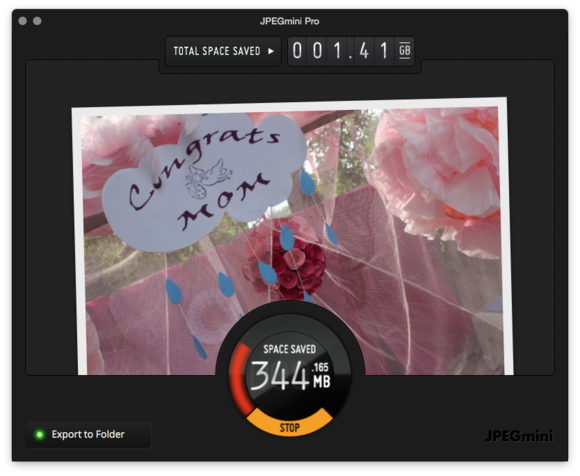 JPEGmini Pro slims down JPEG images with no discernable quality loss, making room on your hard drive or flash storage for more files.